Discussion in 'Apple Collectors' started by Mighty Mac, Feb 19, 2002. Hi, I am new to this site but I was wondering if anyone out there can help. I want to know if the EMate 300 is a good buy. It is on ebay ( http://cgi.ebay.com/aw-cgi/eBayISAPI.dll?ViewItem&item=2003051674 ). If you use or have used one, just want some peoples opinions. Thats vintage. I don't know how much use you'd get out of that baby these days. Is it even compatible with Apple's current line of products?? How does it connect? What software does it need to connect to another computer? Is software available for it?? You need to answer some hard questions. I never got into the Newton OS and I would love to try it out. PLus My other portables I do not take with me on business trips the PB 165c works great but is heavy. and the Duo 280 well I need a floppy drive for a day (any loaners?) i have great software on it but can not find the drive. It would be the relaxation from using it, a break from my windows Office! That is a great site, But does anyone know if it a useful toy? If it's not too expensive I'd grab one. It's probably just a toy, something to play around with, but not to do proper work. I bought an emate 300 several summers back (2 1/2 yrs ago) and I think it's a great toy. My use of it comes and goes, but it's especially fun for trips and bringing to the local coffee shop. You can get ethernet on it (i bought an old PCMCIA ethernet card for mine), but it's pretty slow. I don't think there's a free ssh program for it, but you can webbrowse (slowly) or telnet alright. There are a decent number of games and program/utilities out there for free to keep yourself amused. The best things about the emate are the built-in keyboard and durable shape. If you have big hands you might find the keyboard uncomfortable, though. They're build for kids' hands. For speed and true useability, I'd consider getting a Newton 2100 with keyboard. Those have a 160mhz (err around there) strongARM processor. the emate only has like a 25mhz. BTW, if anyone knows a hack to get a faster strongARM into the emate..... that would be one awesome hack. Thanks all of the information today it has been useful. Though the bid has gone to high for me now. I think I am going to attempt to fix my duo. Just need to find a few odds and ends and I should get it back to working order. I will look into the 2100 I would just like to see the Newton OS, I love the idea of a computer learning my writing and not the other way around. That was such a cool little computer I remember when my Elementary school had one. I bet they still do. The Computer teacher was a huge mac fan. 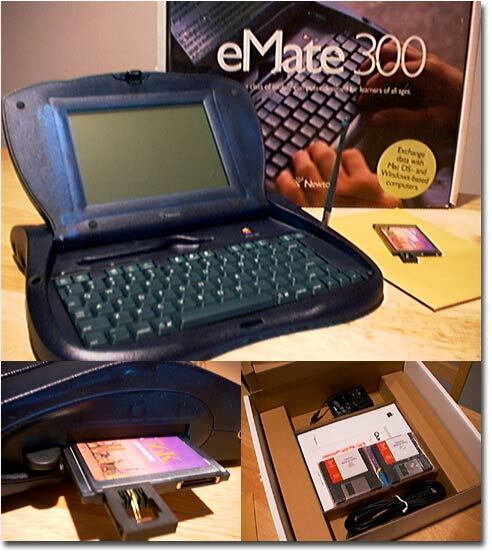 The eMate 300 was a fine machine. I had one briefly. After using an MP2000 (same OS), it was definitely a slower unit, but the bundled keyboard, larger (physical, not resolution) screen, and style were definite pluses. If you've an interest and find one at a decent price, might be worth picking up.